Buick Regal: When Should an Airbag Inflate? 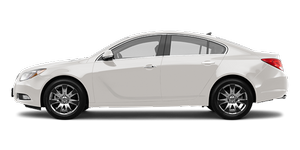 Buick Regal / Buick Regal Owners Manual / Seats and Restraints / Airbag System / When Should an Airbag Inflate? Frontal airbags are designed to inflate in moderate to severe frontal or near frontal crashes to help reduce the potential for severe injuries mainly to the driver's or right front passenger's head and chest. However, they are only designed to inflate if the impact exceeds a predetermined deployment threshold. Deployment thresholds are used to predict how severe a crash is likely to be in time for the airbags to inflate and help restrain the occupants. Whether the frontal airbags will or should deploy is not based on how fast your vehicle is traveling. It depends largely on what you hit, the direction of the impact, and how quickly your vehicle slows down. ► If the vehicle hits a stationary object, the airbags could inflate at a different crash speed than if the vehicle hits a moving object. ► If the vehicle hits an object that deforms, the airbags could inflate at a different crash speed than if the vehicle hits an object that does not deform. ► If the vehicle hits a narrow object (like a pole), the airbags could inflate at a different crash speed than if the vehicle hits a wide object (like a wall). ► If the vehicle goes into an object at an angle, the airbags could inflate at a different crash speed than if the vehicle goes straight into the object. Thresholds can also vary with specific vehicle design. Frontal airbags are not intended to inflate during vehicle rollovers, rear impacts, or in many side impacts. In addition, the vehicle has dual-stage frontal airbags. Dual-stage airbags adjust the restraint according to crash severity. The vehicle has electronic frontal sensors, which help the sensing system distinguish between a moderate frontal impact and a more severe frontal impact. For moderate frontal impacts, dual-stage airbags inflate at a level less than full deployment. For more severe frontal impacts, full deployment occurs. The vehicle has seat-mounted side impact and roof-rail airbags. See Airbag System . Seat-mounted side impact and roof-rail airbags are intended to inflate in moderate to severe side crashes. In addition, these roof-rail airbags are intended to inflate during a rollover or in a severe frontal impact. Seat-mounted side impact and roof-rail airbags will inflate if the crash severity is above the system's designed threshold level. The threshold level can vary with specific vehicle design. Roof-rail airbags are not intended to inflate in rear impacts. Both roof-rail airbags will deploy when either side of the vehicle is struck or if the sensing system predicts that the vehicle is about to roll over, or in a severe frontal impact. In any particular crash, no one can say whether an airbag should have inflated simply because of the damage to a vehicle or because of what the repair costs were. For frontal airbags, inflation is determined by what the vehicle hits, the angle of the impact, and how quickly the vehicle slows down. For seat-mounted side impact and roof-rail airbags, deployment is determined by the location and severity of the side impact. In a rollover event, roof-rail airbag deployment is determined by the direction of the roll.